Summer weather is here! It seems to be getting hotter and drier earlier in the season while having longer periods without precipitation. 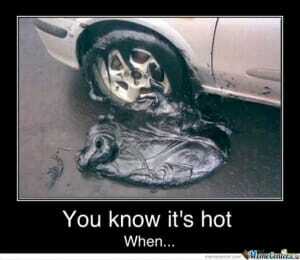 During times of extreme heat, not just cold, is when issues seem to arise on your automobile. There are things you can do to make sure your ride goes smoothly. Battery: Summer heat, vibration and high accessory loads are hard on a battery. The heat can evaporate the battery fluid faster, leading to corrosion on the terminals and connections. You will want to make sure the battery is securely mounted and clean any corrosive build up from the terminals and cable clamps. 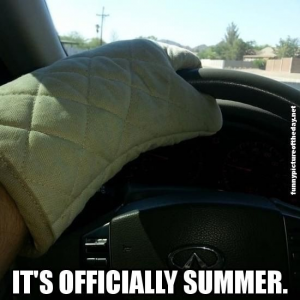 Using the air conditioning and such can cause it to wear out and fail quicker. If your battery is over three years old, it would be a good idea to have it tested by a trained technician to determine how much longer it will last. Cooling system: To keep from overheating, make sure your engine is in good working order. Have the belts and antifreeze/coolant checked. It is recommended to follow your vehicle’s manufacturer guidelines on when these should be drained and replaced. Air conditioning: Keeping the interior of the vehicle at a cool, comfortable temperature not only keeps you and your passengers happy, it also helps you stay alert while driving. If you find your vehicles air conditioning is no longer getting cool enough, the refrigerant charge level may be or low or an indication of a problem. Have it checked by a professional. Other fluids: Just like the human body needs water to keep it’s internal parts in good working order, so do vehicles. Be sure to check the oil, transmission fluid, power steering fluid and brake fluid to ensure they are at the appropriate levels. If any fluids need to be changed or topped off, be sure to use the type of fluid specified in the owner’s manual. Tires: Be sure to check the tire pressure. Even good tires can lose about one pound of air pressure a month. Driving on under-inflated tires not only affects the handling and braking of a vehicle, it can cause tires to overheat and increase the chance of a blowout. Extreme heat can make said problems even more of a concern. You can find the recommended tire pressures in the owner’s manual or on a sticker normally located on the driver’s door jamb. Also, don’t forget about the spare! Even with proper maintenance, summer breakdowns can still happen. It is always a good idea to have a well-stocked emergency kit in your vehicle at all times, including water and non-perishable food items. ← Market Value vs. Replacement Value – Why are they different?